This product is made by JK Adams and sold exclusively by Uncommon Goods. The 'Buy' button above will take you to uncommongoods.com to purchase this product in another browser tab. Your session here at jkadams.com will remain open in this tab. 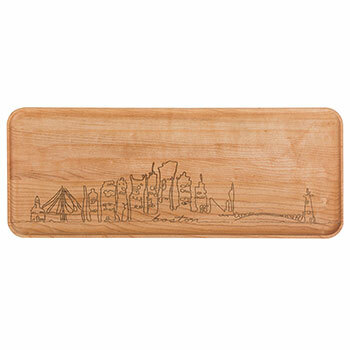 Engraved with eight iconic city skylines from the United States, our Slate Serving Board is a unique way to serve cheeses or can be used as a trivet or candle-base. Drawn by a local Vermont artist, these Cityscapes are sure to bolster hometown (or new town) pride. Wash in warm soapy water immediately after each use and dry thoroughly. Do not uas a cutting board because it will dull your knife. Bought for our son who lives in Long Island, NY. He loves the scape of NYC.